Archbishop Michael Desmond Hynes opened the meeting, acting as facilitator in the absence of our Chairman, Jonathan Larkin, who was unable to attend because of family commitments. Sean Crudden outlined the programme for the Workshop. He explained that our principal speaker, Glenda Byrne, was also unable to attend having been called away at the last minute to an urgent business meeting. After announcing apologies from several regulars and clarifying a few matters relating to the order of business, Sean offered himself as the first speaker. Rather than speak from notes, he read from a short article he had published earlier this week on Indymedia. The full text can be viewed here. In response to an invitation for comments or questions, Liam Kieran pointed out that Brexit provided new opportunities for Ireland. It was estimated that London might lose 75,000 jobs in financial services; we should be planning to capture some of these jobs. As another example, the big British multiples in Ireland import ready made sandwiches every morning from Britain. With the introduction of import tariffs, there would be an opportunity to source these products, and indeed other branches of food processing, locally. He noted that the UK currently exported more to Ireland than to the whole of Latin America because of proximity. He expressed the view that Australia and New Zealand provided little scope for expanding the UK economy because they were so far away, and that African countries offered limited opportunities because they did not have the requisite spending power. Kevin McGeough suggested that Brexit might result in relatively little change because the UK would have to enter into a Customs Union if it wished to remain a big player. Don Johnson noted that the money markets did not seem to favour Brexit, pointing out that the value of the pound shot up when Theresa May lost the first vote on the Withdrawal Agreement. He said the vote to leave was triggered by nationalism, whilst the EEC / EU was initially established to curtail the harmful effects of nationalism, in particular major wars every 30 or so years. Dennis Pringle was then invited to give a talk as the second speaker. He provided a summary of the background to the current situation covering: the Brexit Referendum in 2016; the Withdrawal Notice under Article 50 of the Treaty of the European Union in 2017; talks between David Davis, British Secretary of State for Exiting the European Union, and Michel Barnier, the Chief Negotiator appointed by the European Commission; the Chequers proposal; and the EU-UK Withdrawal Agreement including the backstop proposal to prevent a hard border between Northern Ireland and the Republic. Under Article 50, the UK is due to leave the EU 2 years after formally giving notice (i.e. on 29 March, 2019). Under the terms of the Withdrawal Agreement this would be followed by an interim period during which the UK would in effect remain part of the EU but without voting rights, during which the exact terms for leaving could be negotiated. If an agreement is not reached by the the end of the interim period in December 2020, the Withdrawal Agreement proposes that the backstop will kick in. Under the backstop, the UK would remain part of the Customs Union and in parts of the Single Market. This would eliminate the need for a hard north-south border. By including the whole of the UK, it would also eliminate the need for special arrangements between Northern Ireland and Britain. Dennis noted that the Withdrawal Agreement needs to be approved by the Westminster Parliament. However, it was resoundingly defeated on 15 January, 2019. The main reason for opposition was that the backstop has no time limit, consequently in the absence of terms suitable to all sides the UK would remain partially within the EU but be unable to withdraw. A second vote is to be held on 29 January, 2019. Unless Theresa May can negotiate an improved deal for the UK, this is also likely to end in defeat. This raises the spectre of a hard (i.e. no deal) Brexit on 29 March, although there are amendments proposing that Brexit be deferred for 3 months or 9 months to buy more time. A hard Brexit could very well see the return of a hard border. Other possibilities are a second referendum or a general election. A second referendum could see the Britain voting to remain. Opinion polls currently show a slight majority favouring to remain, but the polls showed a similar majority favouring to remain before the first referendum. 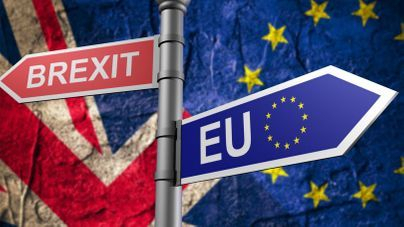 The implications of a general election are unpredictable as both the major parties seem to be divided on Brexit, so the outcome would depend not only on which party (if any) won and the mix of pro-Brexit and anti-Brexit MPs elected on each side. Niall Hayden was then asked to speak (with very little advanced warning). He drew attention to the many benefits that have flowed to Ireland from the EU, such as motorways and improved infrastructure. He also noted that the EU stepped in following the collapse of the Celtic Tiger. However, concerns following Brexit include possible increased numbers of immigrants if the UK did not take any. Also if the UK no longer paid a contribution, then Ireland would presumably have to pay a larger share. A hard border was likely to result in increased levels of smuggling and criminality. The discussion was again thrown open again to the floor. Kevin McGeough pointed out that tariffs could result in a treble hit for manufacturers: imports of raw materials would cost more; exports would cost more to buyers; and a weak pound would mean producers would receive less in real terms. Geraldine Kieran noted that in the context of immigration Ireland currently had the second highest percentage of foreign nationals in the EU after Luxembourg, a point that many found surprising. Eamonn O'Boyle was invited to speak (again at very short notice). Eamonn said that he thought the UK had fenced itself in. He made several important points with regard to the health services (which came up again later - see the report from Group 3 below) and asked what the implications of Brexit would be if Ireland wished to oppose the proposed development of three nuclear power stations on the west coast of Britain. He also mentioned possible implications for travel and jurisprudence. After a short break for tea, coffee and biscuits, the participants were divided into three groups to discuss an allocated topic (Group 1: Travel, Trade and Citizenship; Group 2: Environment, Agriculture, Etc. ; and Group 3: Health, Education, Etc. ), before reporting back to the full body. 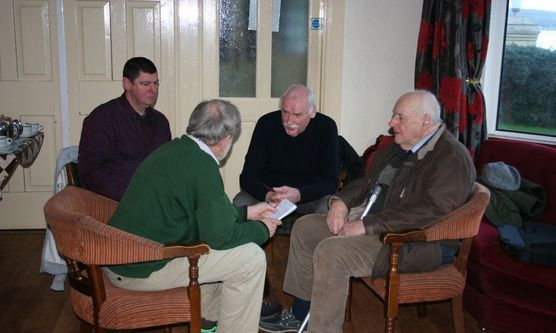 There was widespread agreement that the three rapporteurs (Don Johnson, Niall Hayden and Liam Kieran) each did an excellent job of imposing order on lots of disparate ideas. Points raised on travel and trade by Group 1 included: the possible need for green cards and additional insurance premiums; the implications for air travel, especially the potential implications for Aer Lingus and Ryanair flights from Ireland to other parts of the EU if they are shown to be more than 50% British owned; the impact on cross-border trade and for perishables coming in from Britain; the implications for ex-pats receiving pensions; access to health services in other states; and fishing quotas. Group 2 discussed: the potential for increased smuggling and the impact this might have on guaranteeing the quality and provenance of goods; the need for extra ships for direct routes to Europe; if the UK is not bound by quotas, what impact will this have on fishing stocks; the threat of nuclear power stations; implications for climate change; and the need for even more housing if there is increased immigration. Group 3 discussed: implications for medicines - although Ireland is a major manufacturer of pharmaceuticals, the finishing is often done elsewhere; given that the UK acts as a benchmark, will the cost of hospitals and treatment here increase; the impact on medical training and the recognition of qualifications; cross-border emergency services; cross-border purchases and impact on waiting lists; health insurance implications; and Socrates and research grants in higher education. It was noted that although Brexit provides a lot of threats, it also provides opportunities for Ireland that need to be grasped. A better idea of the breadth of topics discussed can be gauged by viewing the rapporteurs' notes. The final part of the meeting was dedicated to a plenary session to allow participants to make their final comments. Sean Crudden suggested that we should try to focus on the possible impacts of Brexit for the local area, especially with regard to health and environment. Eamonn O'Boyle said it was very difficult for anyone to predict what might happen given the very high level of uncertainty. He suggested the changes might be slow and gradual, rather than occurring overnight. It was possible the British public might even change their mind about leaving. Liam Kieran noted that the Brexiteers wanted to roll back the benefits of being in the EU. Sean Crudden queried whether all the lip-service given by the EU to protecting the environment actually made any difference. Niall Hayden said that there was not much the EU could do if any member state just decided to do its own thing, citing the example of Italy ignoring EU budgetary guidelines. The meeting concluded at 5.30pm. Pictures taken at the 2019 Workshop may be viewed here.